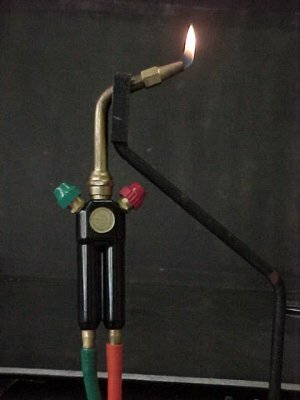 A wide variety of glassworking torches and burners is available to the glassblower. The selection shown here is representative of the burners and torches found in a typical scientific research glassblowing shop, but many other variations exist. The gases commonly used for working borosilicate glasses are propane or natural gas mixed with oxygen. It is important when selecting your burner, torch and tips that they be designed for use with these gases. Units designed for gas/air mixtures should not be used with gas and oxygen. 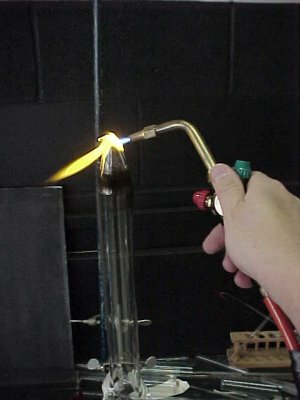 A typical glassblower's burner. Burners are usually bench or lathe mounted. The bench burner shown here has two gas and two oxygen valve controls, offering a wide variety of flame configurations. The aluminum collar shown mounted on the burner barrel aids in heat dissipation. Another example of a glassblower's bench burner. The two inner valves (green = oxygen and red = gas) create a relatively small tight flame. 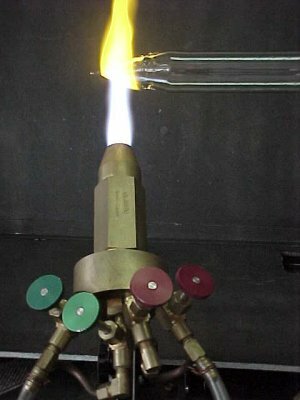 Opening the two outer valves offers the glassblower a much larger flame as shown here. In use, burners are usually stationary or mounted as part of a fixture. The glass is brought into the flame where it is heated and manipulated by the glassblower. Lathe burners are mounted on a movable carriage. The four (4) jet burner pictured can be moved up or down to match the diameter of the glass being worked or rolled back and forth along the length of the glass tubing using the carriage. Each burner jet angle may be adjusted as well. Glassblowing torches are usually smaller and much lighter than burners or burner assemblies. 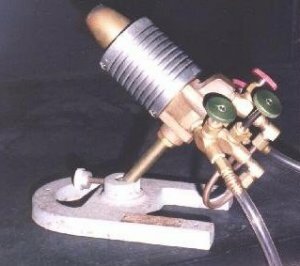 The torch shown here is a pre-mix (gas/oxygen are mixed in a chamber within the torch body) style quite popular with many glassblowers. Pre-mix torches often have removable tips in a wide range of sizes, providing a number of flame options to the glassblower. 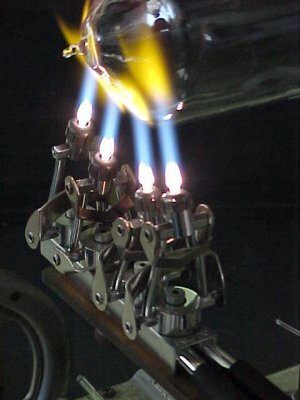 Torches are brought to the glass, which is held stationary by clamps or other fixtures. The size, weight and balance of a torch are important features to the glassblower.